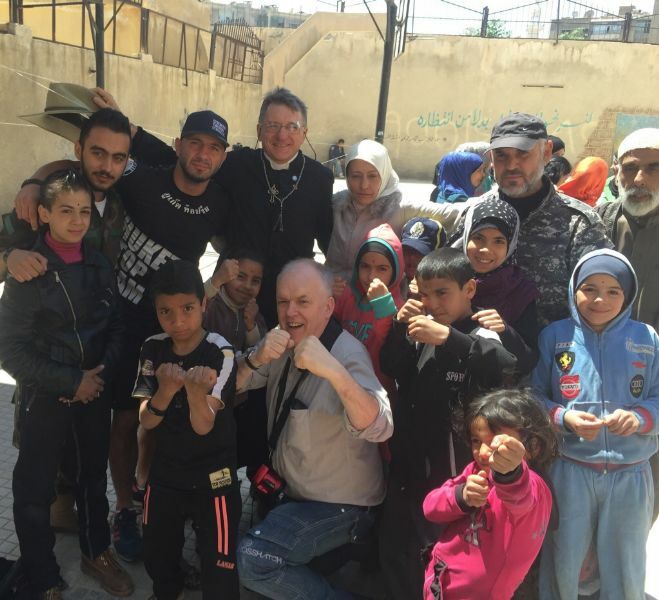 It was quite surreal – enjoying the sunshine as we stood on the doorstep of Yarmouk – an area that the United Nations Secretary General, Ban Ki-moon, recently described as Syria’s “deepest circle of hell”! Admittedly, we were on the right side of the dividing line between the ISIS-controlled section of Yarmouk and the greater area controlled by the Syrian Arab Army (SAA). Even so, we were “within sniper range”, or so we were warned. I didn’t take the sniper warning too seriously until one of our guides pointed to a mosque that was only about 300 metres away. “They certainly have snipers in that minaret” he said. He spoke calmly, as tour-guides do when pointing out landmarks. And he wasn’t running for cover either, and neither were the children who were milling about with us at the end of the street. Presumably the takfiri had more important targets to occupy themselves with. We went into a school, the entrance of which was only a few metres from where we were standing. It was a ‘safe place’ – a compound where the army had relocated families who had fled the ISIS advance. The complex was dotted with mothers with young children and elderly men. Nonetheless, it was evidently still functioning as a school too. We didn’t speak to the leadership team initially but instead went out into the courtyard and got our boxing gear out. Within moments we had a team of children around us. At first they were reluctant to try on the gloves, but after the first brave recruit had given it a go, there was a predicable clamor of ‘me next’ that lasted until we had worked our way through the entire group. I assume ‘me next’ was what they were saying anyway. I must learn some Arabic! I’m certain it wasn’t anything nasty. The kids were lovely. They were kids, though some of them must have already seen more than a lifetime’s quota of violence. 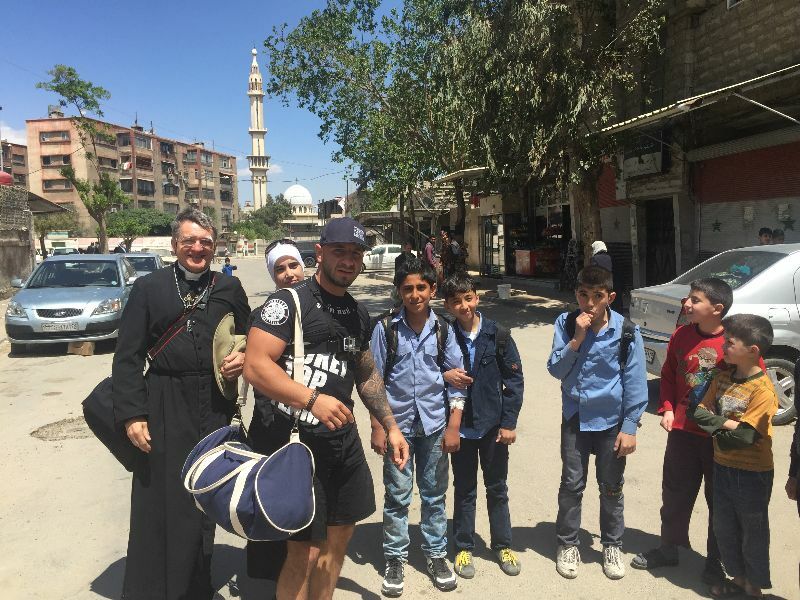 It was a fantastic experience – making it to Yarmouk, playing with the kids, laughing and taking photos with the SAA boys. It was exactly what we’d traveled half way around the world to do! Of course we hadn’t just come to teach boxing. We’d come to see for ourselves the truth behind the media narrative. Various media sources were depicting the people of Yarmouk as the meat in the sandwich – hammered by ISIS on the one hand and pounded by the Syrian Arab Army on the other! From my friends in Syria though I’d been receiving a difference story – that the Syrian Arab Army was doing all it could to relocate people stuck in Yarmouk to safe places outside the firing zone. 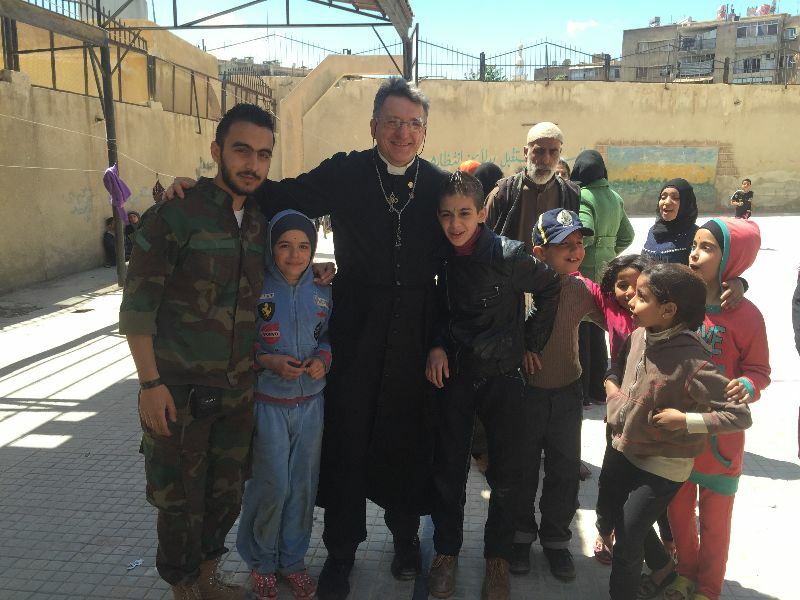 Of course we couldn’t see the whole of what was going on, but from our end of Yarmouk it was obvious at the Syrian Army was doing all it could to help these kids. “We lack pillows” the School Principal said to me afterwards, as we debriefed in his office. “We have food and blankets now but no pillows”. I don’t think he really expected me to bring a quantity of pillows with me on my next visit. Even so, he was focused on his job and ready to accept help from any source. In truth, the greatest help we can give these people is not to send our troops into their country. Contrary to popular opinion, that’s not the sort of help they want from us. That’s the update for now, fellow fighters. Thank you for your support in helping us get to Yarmouk. I hope you can see the significance of this visit. 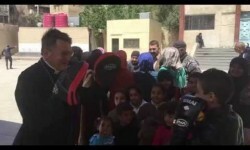 Bringing some joy to these kids and leaving them with gloves and pads (courtesy of our friends at SMAI) was of great value but there is something of much greater significance I hope we can achieve for these children though this visit – namely, help discredit the media narrative that threatens to unleash further violence upon them! Whatever you think of the Syrian government, it was crystal clear to me from our day in Yarmouk that these people do NOT want our foreign military intervention. That will only lead to more death and suffering. P.S. Support the work of the Fighting Fathers by joining our online community at www.fighting-fathers.com. It only costs you $10/month and the first month is free. 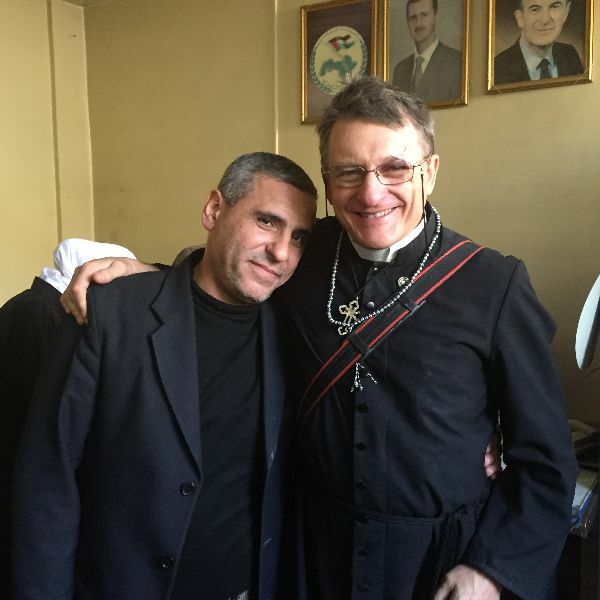 This entry was posted in Monday Missive and tagged ISIS, SAA, School Principal, Syrian Arab Army by Father Dave. Bookmark the permalink.